Classic specimen of Scholzite that could come from the last 1960s find. 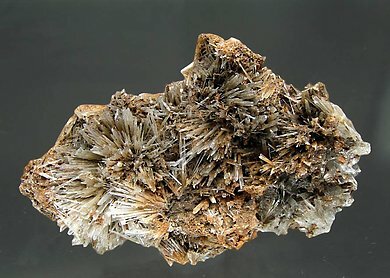 Sprays of white acicular crystals in a closed vug, with some inclusions of clay and on a cavernous Dolomite matrix. Specimens of this rare hydrated calcium and zinc phosphate are scarce. 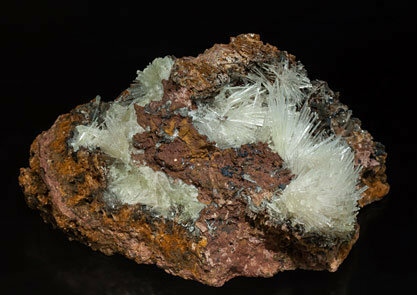 Sprays of lustrous, translucent white, acicular Scholzite crystals on limonite matrix. An excellent specimen of this rare zinc phosphate from the locality that has furnished the best specimens of the species, currently very difficult to obtain. As the pedigree enhances the specimen’s value, we will send the original A. L. McGuinness label to the buyer.